Universal label holder has a self-adhesive backing that sticks to any plastic or metal container and protective clear plastic window. 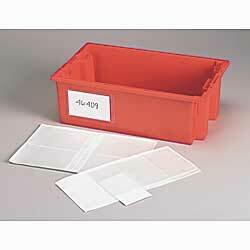 Includes laser/ink jet compatible paper labels with printing instructions. IN STOCK. 50/pkg. SPECIFY SIZE: A - 3" x 5", B - 4" x 6". ZP-0254 3" x 5". Wt. 4 oz. Pkg. of 25. ZP-0255 4" x 6". Wt. 5 oz. Pkg. of 25. ZP-0256A 3" x 5"	 Wt. 3 oz. ZP-0256B 4" x 6"	 Wt. 3 oz.